When you are new to the scuba diving world a scuba mask should be the first piece of equipment you purchase. This is because you will need a scuba mask that perfectly fits your face so it doesn’t leak. 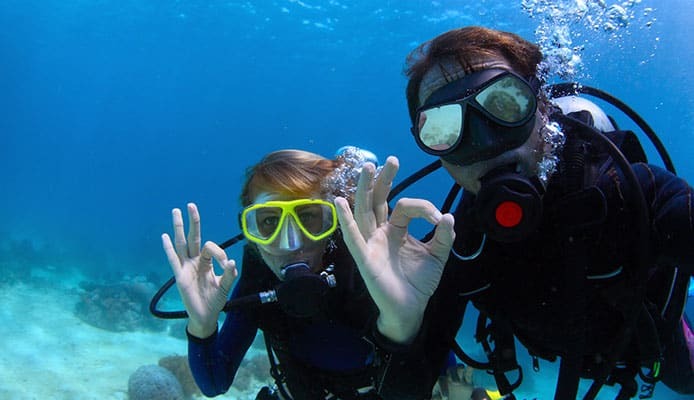 Renting a scuba mask can get you by for a dive or two but if you plan on diving regularly you will want your own mask. Your face shape is unique to you so it is important that you get the best scuba mask specifically for you. What works for you may not work for others. We found the top 10 scuba masks on the market for all face shapes and have listed them here. With a rotational buckle system, this diving mask delivers 180 degrees of views of your underwater adventures. 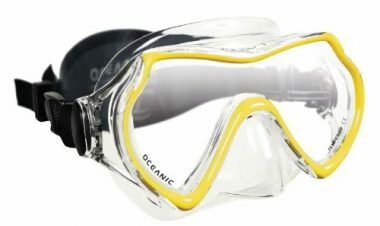 With a round-edge skirt and a large frame delivering wide views this mask will allow you to see more of the ocean around you. A five position strap angle adjuster allows you to get your perfect fit making this mask a great option for almost every face size. The low profile design has minimal internal volume giving you a less bulky look. This smaller mask is ideal for those with small or thin faces. A quick adjust buckle makes fitting this mask quick and easy while the large tempered twin glass lenses allow you to see everything around you without inhibition. A stylish frame will appeal to many showing a bit more personality to your purchase. The large nose pocket is a perfect size while the skirt creates a snug bond to your face without pressure points. Two buckles feature a quick adjust system that allows you to quickly tighten or loosen your mask. An included plastic case will keep your mask safe when you’re not in the water. This mask is actually a scuba snorkel set that gives you even more options with your purchase. A clear double sealed silicone skirt provides comfort and ensures a perfect fit. A low profile design ensures a tight fit while the EZ Equalize nose pocket makes it so your glass will never fog up. The single lens design has seamless side windows that give you an uninterrupted view of the underwater world. 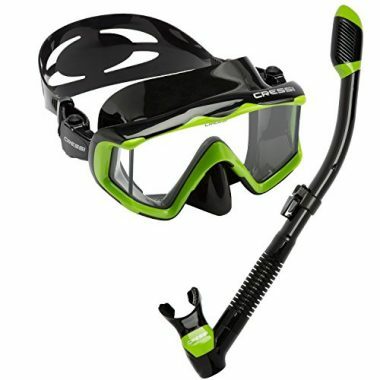 The snorkel on this set is large and equipped with a purge valve for easy clearing. Made with a durable frame and a high quality rubber skirt, this mask is built to last. A tempered glass single lens allows you unobstructed views of the underwater ocean world. This frameless mask has a very modern look being incredibly low profile. Your view will not be interrupted as there is no seams and minimal bezel. A non-slip strap, that is equipped with adjustable buckles, makes this mask fit tightly and secure to your face. The lightweight design allows you hours of exploring without fatigue. Additionally, this ScubaPro mask is low volume which is perfect for people who prefer low maintenance gear. This rugged looking mask is bound to keep you safe and happy underwater. The tempered glass allows you wide viewing angles while the wrap around glass doesn’t obstruct your view. A lightweight polycarbonate frame adds to the construction and style of this scuba mask. The single head strap is fully adjustable from both sides allowing for the perfect fit every time. A high quality silicone skirt fits comfortably against your skin with no pressure points. The Cressi panoramic mask is an excellent choice for any skill level diver. 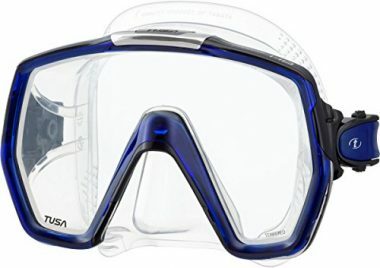 This Cressi option is an exceptional scuba mask. Features like crystal clear silicone and flexible buckle system make a mask that is comfortable and easy to use. 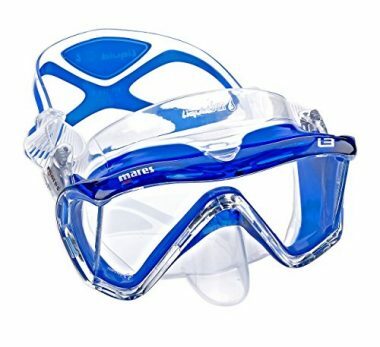 The included lenses allow for better mobility and speed through the water while the low volume requires only a small amount of air to purge the mask. Do you wear glasses? There is the option of having your corrective lenses built into this mask. The strap is flexible, nearly indestructible, and easy to use creating the perfect fit no matter the size of your head. 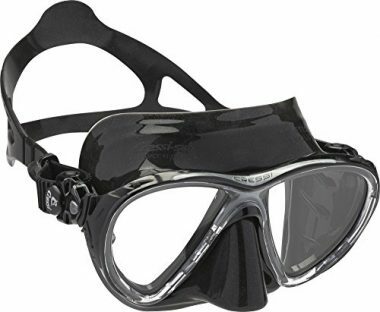 The Atomic Frameless 2 scuba mask is a perfect addition to your diving gear. It uses an ultra clear single pane of glass that allows you to see the environment as it actually is. Not having seams in the glass gives you an unobstructed view while the low volume makes purging and cleaning a breeze. This mask also has one of the easiest systems to adjust its buckles. Touted as a “Squeeze-to-Adjust” system all you need to do is add pressure and pull the edge of the strap. A comfortable skirt creates the perfect seal while maintaining a comfortable fit. This is a mask that will fit people with large and medium faces making it an all around top buy. 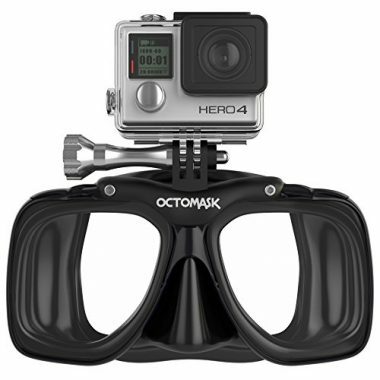 This unique mask allows you to effortlessly record your dive. An included GoPro attachment will easily attach any model to the top of your mask. Just strap it on and you’re ready to go. The large, wide lenses allow you to see everything in front of you while the small frame doesn’t inhibit your sight. A soft skirt ensures a perfect seal against your skin without unwanted pressure points. Let your friends and family see what you did on your dive! Did we mention the mask comes with a 100% fit guarantee? The Oceanic Mako Dive Mask is a lightweight option that will make it feel like you aren’t even wearing a mask. This is due to the high quality tempered glass and minimal materials used in the design. Not having a solid frame increases your line of sight and viewing angles allowing you to see everything around you. A comfortable strap cradles the back of your head with a wide strap. It is adjustable on both sides allowing you to get the perfect fit. A small skirt allows coverage while not being overbearing on your face. The high grade silicone will conform to your face which will ensure it stays snug during your entire dive. Mares has a reputation of excellence as a scuba mask producer and quickly became diver’s go to for gear. This setup has been designed to be comfortable for wider faces. The large piece of front glass has angles that do not restrict your vision while the two smaller panes wrap around the corners creating full framed sight lines. A large skirt ensures that this mask will fit comfortably while the large x shaped strap ensures it sits properly on your face without pressure points. This is a very well constructed mask that also keeps you looking stylish. This is a great scuba mask for large faces. The best scuba mask will be a combination of fit, feel and comfort. 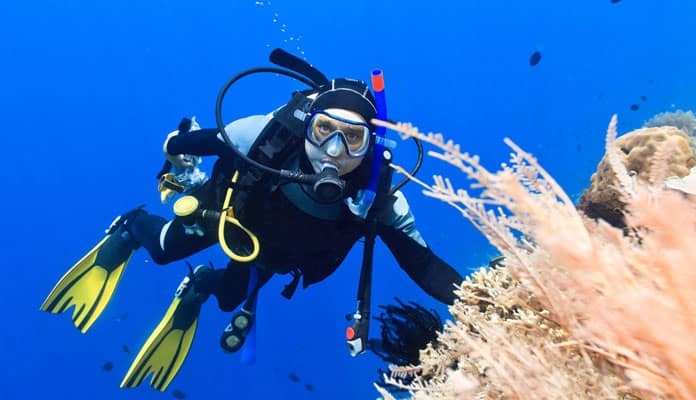 You should not buy any scuba gear that makes you feel uncomfortable or nervous in any way. These feelings will only get worse when you’re under water. Dive mask reviews agree that getting the right fit is a crucial part of purchasing a dive mask. There are many ways to ensure it will fit. The easiest way is to put it up to your face where it would sit without the straps and breathe in through your nose. If the best scuba diving mask stays on your face it fits. If it falls it does not. This will allow you to continue to put the straps on and snug it to your face. Keep in mind of pressure points or places that do not feel comfortable. If it doesn’t feel good in the store it will not get better when you’re underwater. While it is on your face look around and make sure you don’t have any blind spots or distorted vision. This will only get worse when submerged. The strap should be supportive but not constricting. A wider one will generally reduce pressure by distributing it over the entire width but is a personal preference. This is the main feature that will determine your visibility, and thus your enjoyability, under the water. If you can’t see what’s in front of you the dive will be pointless. Corrective lenses: If you use glasses and don’t want to wear contacts while diving, look for lenses that can have your prescription added to the lens. 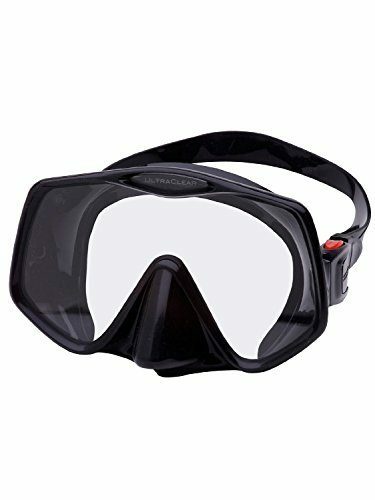 This will allow you to throw your mask on without worrying about lenses falling out or adjusting your glasses underwater. 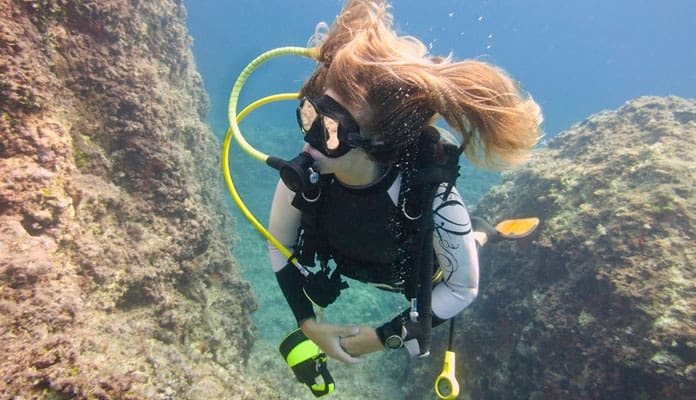 Lens angle: Most of the best scuba diving masks do not have the same lens angle as your face. This will allow you to look around easie, mainly down. The lower angle reduces the amount of glass you need to see through which will create less strain on your eyes. A lower amount of volume in the mask will also make it easier to purge and equalize the water and pressure. Single lens masks have an uninterrupted look and feel. There are no seams that can distract or interrupt your view. These are an excellent choice for people who don’t mind moving their head to see the full picture. Multi lens masks make use of more than one pane of glass to expand your periphery. Instead of having a large bezel and surround, these masks will have an angled piece of glass that allows you to see more of the water around you without having to move your head. This is a critical part of the comfort of the best scuba mask. It can cause unwanted pressure points and even pain, or make for an ultra comfortable setup where you forget you’re wearing a mask. We find that a large width silicone strap works best as it will not slip and disperses the weight over a larger distance. The buckles should be easy to adjust even in adverse conditions. Look for masks that have a dual strap system. Being able to tighten one side at a time creates the perfect fit. Ones that have this where the straps connect to the mask make it easy to adjust instead of having to reach behind your head. This lessens the pressure on the skirt against your skin making the mask fit better and more comfortably. The skirt is the part of the mask that rests against your cheek and is responsible for creating the watertight seal. Even though it uses pressure to do this you should not be able to feel it. Comfortable materials are used to increase comfort and add an extra layer to the all important seal. A high-end silicone is mainly used for this part of the mask. It is comfortable and does an excellent job at creating a seal. Some manufacturers also use a dual skirt system for added comfort and seal. The frame of the mask is a key aspect of sight and look. If the frame is too bulky it can alter your sight lines restricting your vision. A clear silicone frame will allow you to see through it while making you feel like open and airy. The darker the frame the more likely you are to feel claustrophobic. Some frames allow you to completely disassemble the components allowing you to easily clean and care for your mask. This will increase its lifespan and ensure it will not fog on your next dive. This feature also lets you interchange pieces making it much easier to repair and fix. The frame is also the part that dictates the overall size of the mask. If the frame is bulky and large it will add weight and put a strain on your neck and shoulders. Frameless masks have all of the components like the skirt and buckles molded together. This greatly reduces the weight of the unit but makes it almost impossible to repair. Forget about installing prescription lenses on this type as it is not possible to remove or work on the glass. The size of the nose pocket can vary. Finding one that fits comfortably is key as it can cause pressure that can affect your dive. A slight space between your nose and this soft piece of material will ensure you stay comfortable even on prolonged dives. If you take care of your mask it will last you for years. There are simple things that you can do after every dive to ensure it is fully cleaned and ready for the next day on and in the water. Your mask will come with a film on it from the manufacturer that will cause your brand new mask to fog the first time you use it. To combat this it is recommended to use a cleaner to get rid of this film. Instead of buying an expensive cleaner you can try using toothpaste. This will get rid of the film and create a layer that fights fog. Make sure you rinse the inside of your mask with freshwater to get rid of the extra residue. Instead of spitting in your mask in an emergency bring baby shampoo or a defog solution. Bacteria from your saliva can affect your skin and eyes which can be bad while diving. If you are doing multiple dives in a day put your mask in a pot of freshwater. This will keep it from fogging as it keeps it clean as it will dissolve any salt water crystals that have accumulated. When entering the water it is recommended that you put a hand on your mask to ensure it keeps its seal to your face. Never leave your mask face down on anything but a clean soft cloth. People who wear glasses know the trials and tribulations of a scratched or blurry lens. This is the same as a marked up mask. Much like between dives give your mask a bath in fresh water to dissolve the salt water. If you have the know how and your mask is capable of being taken apart do so. Clean each individual piece with a soft cloth. Avoid using alcohol or any product with an oil base as it can degrade the masks materials. Even though many masks are beautiful and stylish it is not recommended to store them in direct sunlight. A cool dry place is a perfect place to store your mask. If it comes with a carrier you can store it in that or place it on a soft cloth. 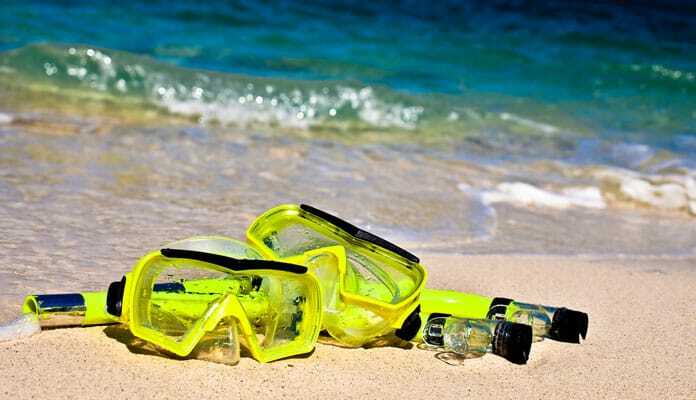 A scuba diving mask is one of the first pieces of equipment which you will purchase before going into the water. It is also one of the most important. A great scuba diving mask will keep the water out, and keep you safe. It is amazing to be able to see the depth of color and splendor of the underwater world. 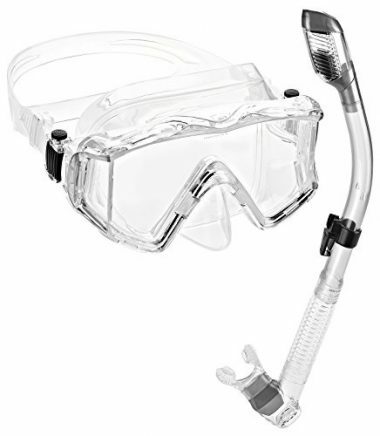 The best scuba mask will keep salt water and other debris from getting into your eyes. Everyone has different needs when it comes to a scuba mask. The great thing about scuba diving being so popular is that there are so many masks to choose from. 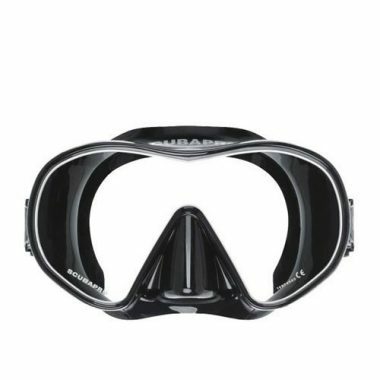 It does not matter what size of face you have, the needs for your dive, whether you need prescription lenses or not, or anything else, there will be a mask which is perfect for you. 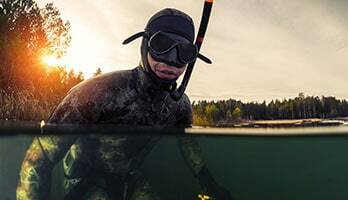 We would not let you dive right in (sorry) to the world of scuba diving without giving you a little information about what to look for in a scuba mask. A scuba mask seems like a simple topic, but once you delve into it, there is a lot of information out there. We have the essential information which you need to buy the perfect mask. Here are our top 10 scuba masks of 2018. Q: How Do I Test The Fit Of A Scuba Mask? A: When you buy your mask, you will want to test the fit of the mask before you go under the water. Ensuring that you have the correct fit will stop the water from entering your mask and annoying you on your dive. The first thing to do is to adjust the straps so that they are at the largest size. Push back any hair which may be in the way of the edge of the mask (tie back hair if it is long). Put the mask on your face, and make sure that it is centered and comfortable. Put the snorkel in your mouth and then breathe in through your nose. If the mask is in the correct position, you should feel the mask sticking to your face. Place the straps around the back of your head, and adjust them until the mask fits snug. The mask should feel comfortable and not tight. If the mask stays put on your face, then you have a good fit. Q: How Do I Care For A Scuba Mask? A: If you take care of your mask, then it will last you for a long time. It will also prevent any accidents from happening under the water. A taken acre of mask will have less chance of fogging up or letting the water in. After every dive, especially if you are diving in salt water, you should take the time to clean your mask. You should rinse your mask after every dive. Use fresh water to rinse any salt and debris from your mask. If you find that rinsing it does not get off all of the dirt from the mask, then you will have to give it a proper clean. Fill a bucket with some warm soapy water. Submerge the mask in the water, and use a sponge to wipe the mask clean. When it has been cleaned, rinse it with fresh water. After rinsing your mask, you should always let it dry before putting it into storage. When you are drying your mask, do not let it dry in direct sunlight. The UV rays can damage the mask. Silicone, plastic, and other materials can crack over time. You should always store your mask correctly. When your mask is in your dive bag for transport or in a storage area, you should make sure that it is not stored beneath a lot of heavy scuba equipment. You should always ensure that your mask is completely dry before storing it for long periods of time. Store the mask in a cool, dry place. Check your mask for any damage after every use, and if it is damaged, then it is better to fix the problem immediately before it becomes a bigger problem. 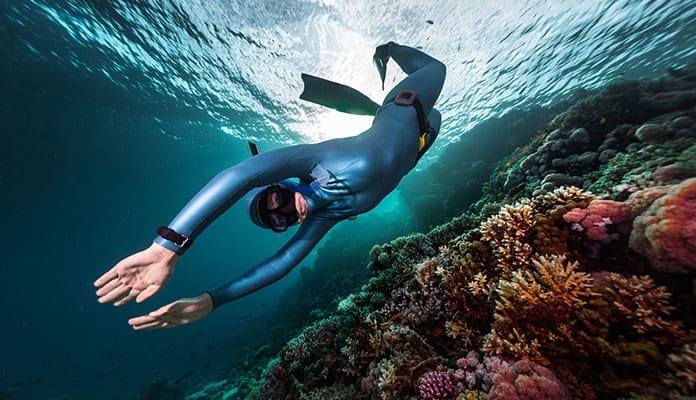 Q: Single or Dual-Lens Dive Masks, Which Is Better? A: A lot of the choice depends on your personal preference. The point is that there is no correct answer, and a lot of the choice is dependent on how the mask feels on your face. If you like how a single-lens feels, then go for that. If you like the feel of a dual-lens, then go for that. Dual-lens masks are usually lower volume than single-lens masks. Single-lens masks are easier to find with prescription lenses. If you feel claustrophobic with a small field of vision, then you should choose a dual-lens. A large lens can have seems in it which can be distracting, but they will allow you to feel more free. Q: What Is The Best Way To Avoid Leaks And Fogging? A: Fogging and leaking are something which all scuba divers will have to deal with. The only thing more annoying than your lens fogging up or water dripping down your face to pool at the bottom of your mask, is both happening at once. Thankfully there are some things which you can do to prevent them. If you do have water getting into your mask, then you may want to try loosening your straps. It may seem counterintuitive, but if your mask is too tight, then the skirt can splay, and the seal can be broken. The underwater pressure should keep your mask on your face. As long as you are looking down, the mask will be sealed. If you look up, the air in your mask may force the mask up and off of your face. Some masks come with anti-fog technology. You can also buy an anti-fog spray to use on your mask when you are diving. If you do not have any anti-fog spray, then there are a couple of household items which you can use. Rubbing dish soap or toothpaste on the inside of your mask can stop it from fogging up in the water. A top-rated scuba mask will give you the perfect fit. It will be comfortable in the water. It will keep the water out and give you an amazing field of vision. It is important to protect your eyes in the water and important to enjoy your time in the water. The best scuba mask will do all of that for you and more. Take the time to understand the information we have presented to ensure that you choose the correct mask and then take care of it. The masks which we have presented are used by divers all over the world. They are built to stand the test of time and deliver a clear vision of the underwater world. They will keep your eyes protected. After absorbing the information you need to know, you will be equipped to make the best decision with a scuba mask. Go get the perfect mask, dive under the water, and enjoy all that the underwater world has to offer you. Have the best scuba mask on our list? Let us know how you like it in the comment section below.